All the aspect of a social engineering attacks were covered in the caller’s presentation: First, he tried to get my attention (of course I had all my attention! ;-): “I see that you’re using a Windows computer at the moment. didn’t you detect any suspicious activity for a while?“. Then, he tried to scare me: “Your computer is infected with malwares and viruses!“. The next step was to make me confident: “Let’s see how we can solve this together…“. Then the fun part started! “Are you in front of your computer right now? Oh, I see again some malicious activity!”, then “I’ll ask you to type some commands to solve all your problems“. The guy was very patient and even helped me to find the “Windows” key on my keyboard (“You see, the key with four small squares representing the Windows logo“). Another three minutes to explain me how to press “Windows”-R at the same time. And again a few minutes to spell the URL to type: “W like William, again W like William, etc” (he never mentioned technical terms like URL, browser, etc…). At this point, I expected to collect some interesting URLs with a malicious payload but why do complicated stuff when the Internet is full of remote control services? He asked me to visit www.support.me which is an alias for secure.logmeinrescue.com/Customer/Code.aspx and gave me the 6-digits code required to download and start the remote support session! During all the conversation, I tried to grab information about him, how did he got my number, how Microsoft detected that my computer was infected. I also asked him to “connect to my computer” to get his own in my firewall logs but no luck… Every time the guy came back to his “script”. After approximatively 15 minutes, I dropped the call (I did not have a computer ready for him). 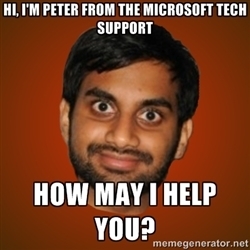 It can be that the call centre is a (ex)partners of Microsoft! Only Microsoft and India can stop this scam! So, remember to just have your fresh VM always handy! Apparently in Belgium we’re good targets. I got the same call Yesterday and had one already a few weeks ago. As I’m living in Ardenne, getting a phone call in English should really limit the number of potential targets that can answer them in English. How they got the phone number remains strange to me. I have already received the same call, and I am in France too. They’ve been calling people in non-English speaking countries for quite some time. (IIRC at least France, Sweden, Netherlands, Switzerland.) I spoke to someone in France who told me that the fact that they spoke English made it sound more serious. They also call me, in the UK, quite a lot. Because I have convinced them twice I fell for it – once gave a made-up cc number., the other time I promised I’d get a pre-paid debit card later on. They run a few free tools (disk defragementation, sometimes they install Security Essentials). Nothing malicious and the sad irony is that for some people, this would make their computer actually run better. Ping me if you want to know more! My parents have been contacted too. Sometimes multiple times a day, days in a row. At first they tried to get rid of it by stating they don’t understand english. After a few times, they contacted them again in their native language (with a very bad accent). They are persistent for sure! @xme Get a call the next day, I think they remembered my voice.. they hung up right away. Figure they’d remove my number by now. @xme My favourite is when they realize I’m not running windows. 3 “support” people, and 20 mins later they drop the call.